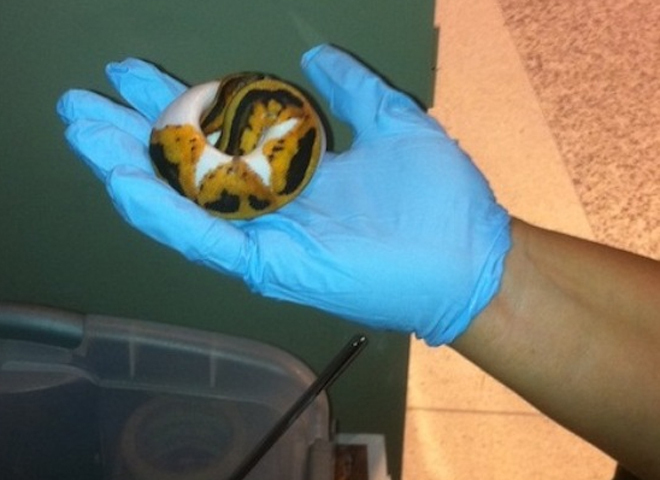 U.S. officials arrested a man at Miami International Airport last week trying to board a Brazil-bound flight, after they found seven exotic snakes and three tortoises hidden in his pants. The Transportation Security Administration said Monday that officers at a security checkpoint were using a millimeter wave advanced imaging technology machine last Thursday morning to screen a male passenger when they found "items suspiciously hidden," reports CBS Affiliate WKMG. Further inspection revealed seven exotic snakes and three tortoises secreted in lady's hosiery inside the man's pants, according to The TSA blog. Officers with the U.S. Department of Fish and Wildlife arrested the man on federal charges of illegal trafficking in wildlife. The TSA reported another incident of animal smuggling last week, in which two endangered birds were found wrapped in socks and taped to the leg and chest of a woman trying to board a flight from Los Angeles to China. A routine pat-down led officers to find the birds, and the woman's arrest.